Located in Patriot's Landing, very central to the center of the resort and within walking distance to the Main Grande. Step up onto the inviting front porch, and into a house that features characteristics of a quaint New England beach home. Warm colors and nautical accents add to the seaside ambiance. The breakfast bar has a dining room for two, and a large glass top dining table has seating for 5. A cozy nook allows for a good book, or for the kids to have their own area for relaxing. The inviting living area has beige leather sofas surrounding the 55' LCD TV with DVD player. A set of glass doors leads out to the large pool deck with a pool and outside seating. This house features Prism Preferred TV with HD and premium Channels! Upstairs all three bedrooms have cable TV with new updated 40" LCD TV's The master bedroom has both a walk-in shower and a separate garden soaking tub. You will also find private access to the upstairs balcony with fantastic views of the lake. The second level also features its own mini bar and sink. 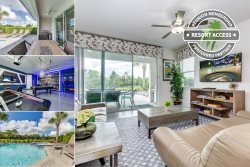 With all that Reunion has to offer whilst you are staying with us, only being just 6 miles to Disney, very close to other major theme parks, and rates starting at just $190 a night - what more could you ask for? Reunion finest rentals at affordable rates. Click on the instant quote icon on the top right of this page to see your detailed quote now! Pool heat is available for a fee, and is recommended from the 31st Oct. to the 31st Mar. This villa is located in the heart of Reunion with views across the lake. The style of New England villa is fitted out internally to reflect this style. Ideal layout with all 3 bedrooms on the same floor. Very clean. We had a great time and would consider renting from here again.